The oncoming winter storm has now been upgraded to a blizzard. Holt County residents are in a blizzard warning from 6 p.m. on Sunday until 6 p.m. on Monday. According to the National Weather Service, snow is expected to begin in the early evening hours, becoming heavier over night. Accumulations are expected of up to 15 inches. Northern winds reaching 45 miles per hour are expected with this storm, causing any travel to be near impossible. Up to 15 inches of snow is possible Sunday and Monday in Holt County, according to the National Weather Service. 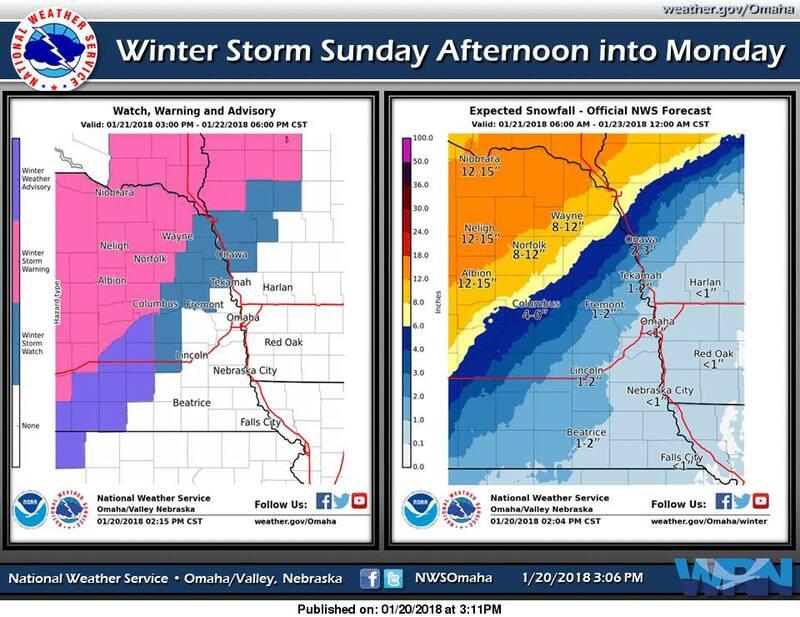 A winter storm warning will go into effect from 3 p.m. Sunday through 6 p.m. Monday. Mixed precipitation is expected late Sunday afternoon and will transition to heavy snow Sunday night and last through Monday. Travel will be very difficult to impossible Monday morning. 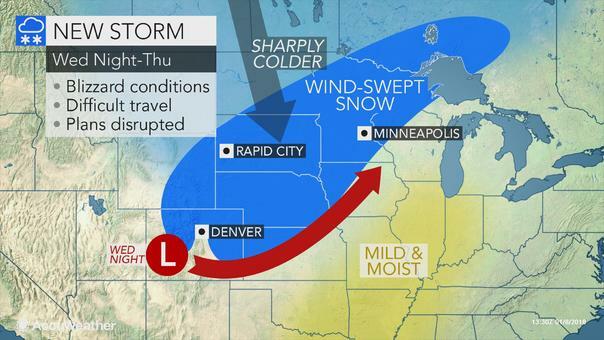 A snow storm is expected Wednesday and Thursday, leading to blizzard conditions and extreme cold, according to the National Weather Service. Nebraska will see its lowest wind chill forecast yet over the weekend as the New Year rings in. Rain and storms continue to pound Holt County this evening. 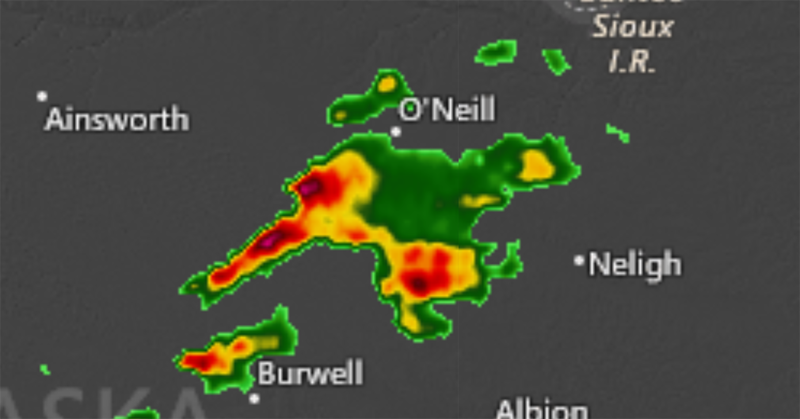 A severe thunderstorm warning remains in effect for the area until 8:15 p.m. At 7:22 p.m., severe thunderstorms were located along a line extending from seven miles northwest of O`Neill to 12 miles northwest of Amelia, moving southeast at 25 mph. Wind gusts of 70 mph and nickel-sized hail are likely with the storm. ​Locations impacted include O`Neill, Chambers, Page, Amelia, Inman, Emmet and Sunfish Lake. A severe thunderstorm warning has been issued for Southwestern Holt County until 4 p.m. 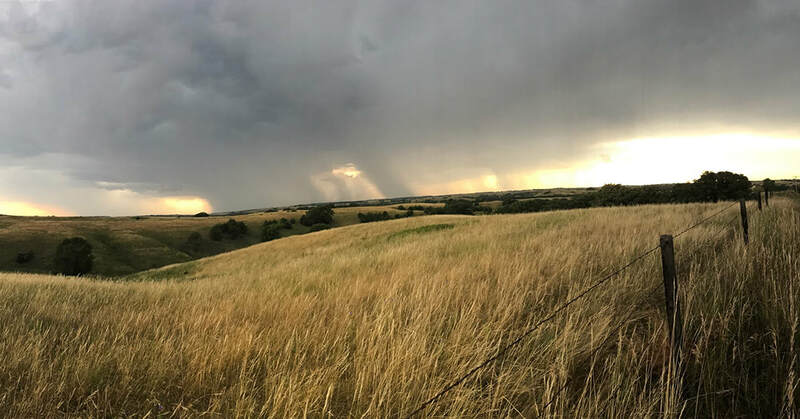 The National Weather Service issued the warning at 3:15 p.m. when a severe thunderstorm was located near Amelia, 27 miles north of Burwell. Locations impacted include O'Neill, Chambers and Amelia. Winds are expected to reach 50 MPH. A thunderstorm continues to push its way through southeastern Holt County on Tuesday night with 60 mph wind gust and penny-size hail. 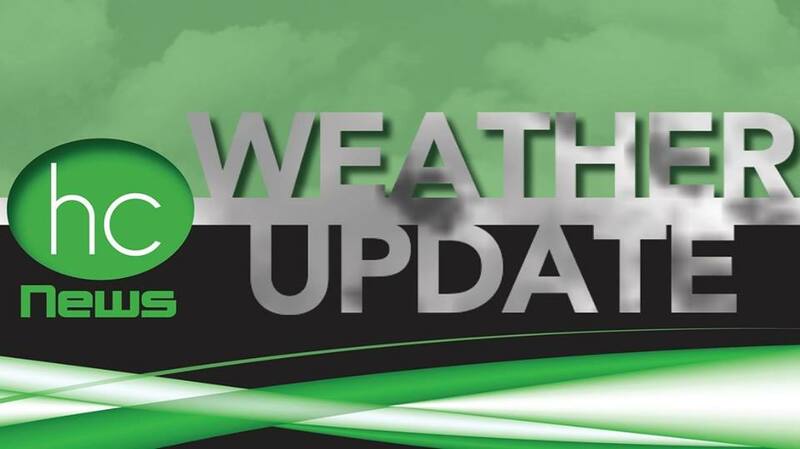 The National Weather Service has issued a thunderstorm warning until 11:15 p.m. in eastern Wheeler and southeastern Holt. The storm extends from 13 miles southeast of Chambers to 6 miles northeast of Bartlett, moving east at 55 mph. Areas impacted include Knievels Corner. Tornado Warning in Holt County Until 5:45 p.m.
A tornado warning remains in effect until 5:45 p.m. in northwestern Holt County. Two inch hail is expected with this storm, which is located 10 miles southwest of Butte. Flying debris will be dangerous to those caught without shelter, according to the National Weather Service. Damage to roofs, windows and vehicles will occur. Take cover and move to a basement or interior room on the lowest level of a sturdy building. 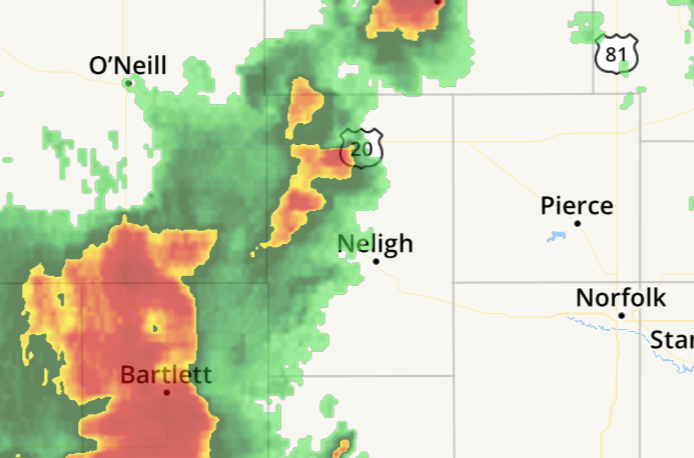 The National Weather Service in North Platte has issued a tornado warning for Northwestern Holt County until 5:30 p.m.
At 4:44 p.m., a severe thunderstorm capable of producing a tornado was located 15 miles of Naper, or 19 miles northeast of Bassett. Rotation was indicated by the radar. This storm is capable of producing a tornado as well as quarter-sized hail. It is important to take shelter immediately until the storm has passed. Local law enforcement are urging motorists to stay off roadways since even plows are difficultly. "Even the plows are having a difficult time out there. 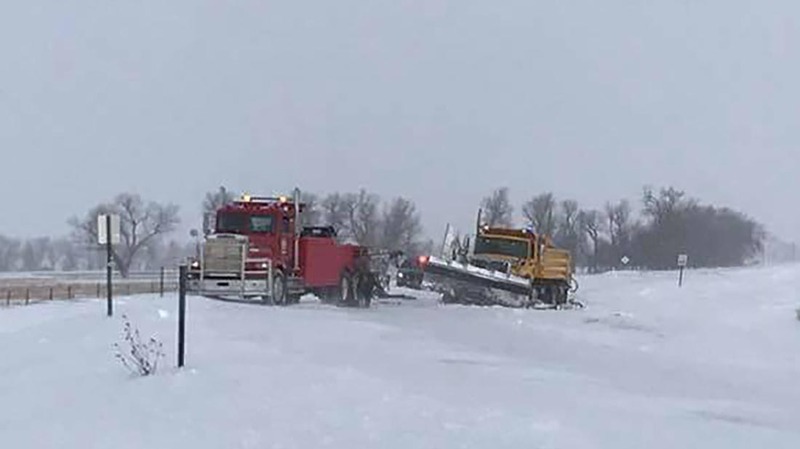 Stay safe first responders, road crews and tow truck drivers," said a Facebook post by the O'Neill Police Department. "Please stay home today friends and let crews do the work they need to to get roads open in these difficult conditions."